PRESSURE GAUGE, 0-60 p.s.i., R.H. - F.H. Steinbart Co.
Home / Gas Equipment / Regulators / PRESSURE GAUGE, 0-60 p.s.i., R.H.
0-60 PSI replacement regulator gauge with right hand thread. 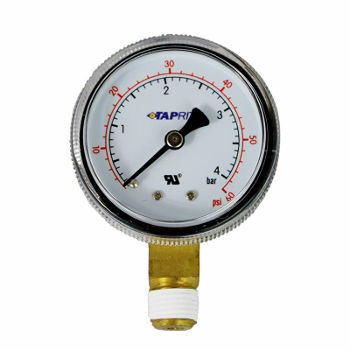 Use to replace any damaged low pressure regulator gauge which uses 1/4″ npt right hand thread. NITROGEN REGULATOR, Tap-rite, 0-60 p.s.i. DOUBLE GAUGE REGULATOR, Co2, 0-60 p.s.i.